The church and the school are the eyes of the country community. They serve during the early development of the community as means of intelligence and help to develop the social consciousness, as well as to connect the life within the community with the world outside. They express intelligence and feeling. But when the community has come to middle life, even though it be normally developing, the eyes fail. They are infallible registers of the coming of mature years. At this time they need a special treatment. Like the eyes, the country church and country school register the health of the whole organism. Whatever affects the community affects the church and the school. The changes which have come over the face of social life in the country record themselves in the church and the school. These institutions register the transformations in social life, they indicate health and they give warning of decay. In a few instances the church or school require the attention of the expert even in the infancy of the community, just as the eyes of a child sometimes need the oculist, but with normal growth the expert is called in for problems which have to do with maturity. In these chapters the center of attention will be the church, regarded as an institution for building and organizing country life. It is not the thought of the writer that the church be treated in ecclesiastical terms. It is rather as a register of the well-being of the community that the church is here studied. The condition of the church is regarded as an index of the social and economic condition of the people. The sources of religion are believed by the writer to be in the vital experiences of the people themselves. In the process of religious experience the church, the Bible, the ministry and other religious methods and organizations are means of disciplining the forces of religion, but they are not the sources of religion. The church in the country above all other institutions should see what concerns country people as a whole. If vision be not given to the church, country people will suffer. The Christian churches are rich in the experience of country people. The Bible is written about a "Holy Land." The exhortations of Scripture, especially of the Old Testament, are devoted to constructive sociology, the building and organizing of an agricultural people in an Asiatic country. Many of the problems are oriental, but some of them are precisely the same as are today agitating the American farmer. 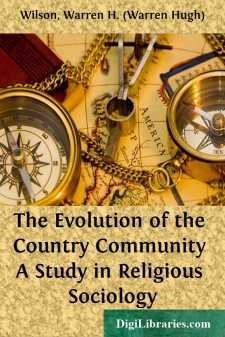 Religion is the highest valuation set upon life, and the country church should have a vision of the present meaning as well as the future development of country life in America. The country church ought to inspire. It is the business of other agencies, and particularly of the schools and colleges, to impart practical and economic aims. But these will not satisfy country people. No section of modern life is so dependent upon idealism as are the people who live in the country. Mere cash prosperity puts an end to residence in most country communities. Commercial success leads toward the city. The religious leaders alone have the duty of inspiring country people with ideals higher than the commercial. It remains for the church in particular to inspire with social idealism. Education seems hopelessly individualistic. The schoolmaster can see only personalities to be developed. It remains for the preacher to develop a kingdom and a commonwealth. His ideals have been those of an organized society. The tradition which he inherits from the past is saturated with family, tribal and national remembrances. His exhortations for the future look to organized social life in the world to come. He should know how to construct ideals out of modern life, which are organic and social.